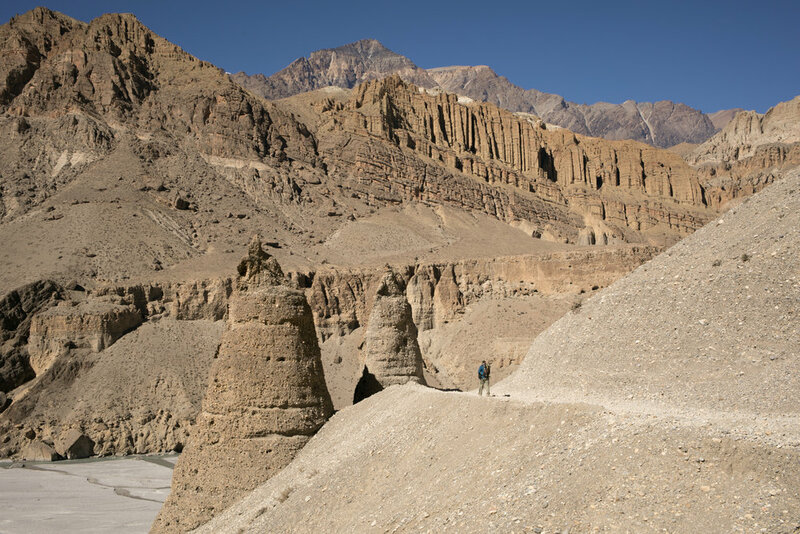 In November of 2016 Aaron and I set out to visit the remote region in Nepal known as the Upper Mustang with our guide Lakpa and porter Ram. The year previous our friends Ambrose and Irene had done the trip themselves and offered to help us plan the trek. To this day, it is the most powerful travel experience I have had. I invite you to hover over the photos for captions that help to tell a little bit of the story of our trip. To embark on our trip to the Upper Mustang we first needed to get from Kathmandu to Pokhara where we would catch our flight. We hopped into a hired car and rode the dusty, bumpy road to Pokhara. Dust and exhaust from the trucks around us filled the air. We covered our faces with bandanas and settled in for the ride. 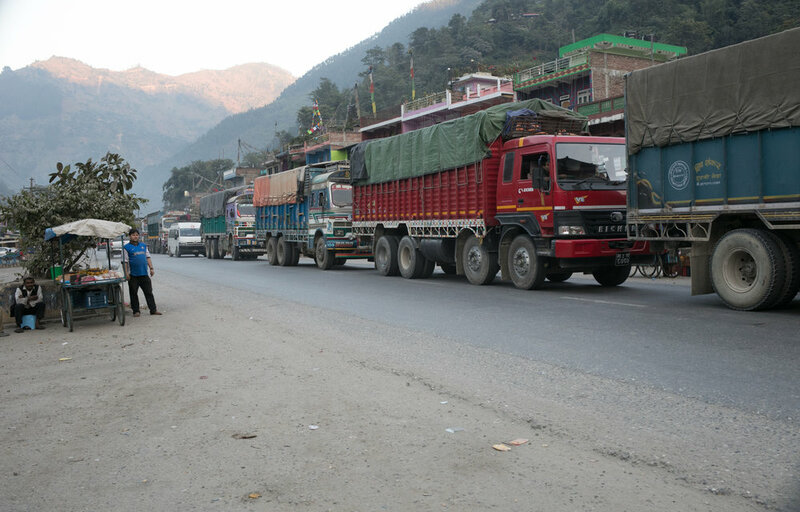 Large trucks from India ship good through Nepal. After an evening in Pokhara we boarded a small plane to fly to Jomsom where we would begin our trek to the Upper Mustang. We were lucky to find a weather window as our fist flight had been canceled due to winds. As we flew the ground cover quickly changed from lush rich green to a dry and arid desert.. I watched the shadow of our plane dance on the land below. 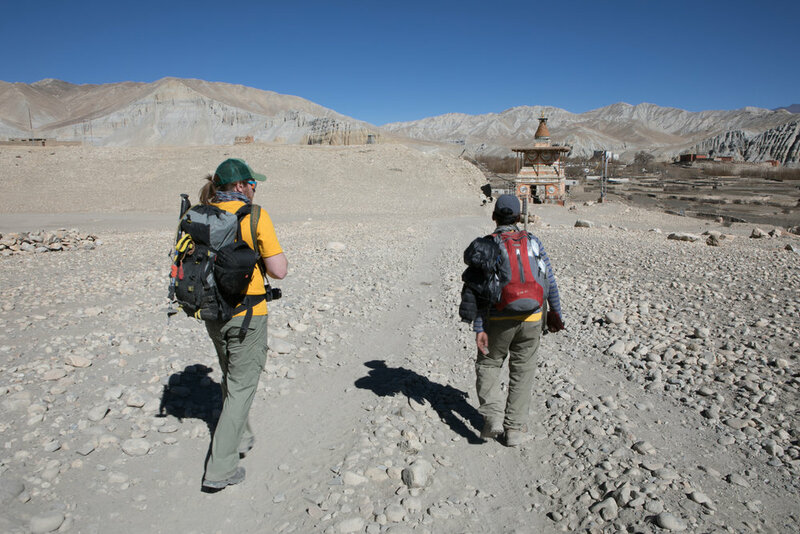 We sorted our gear and began walking along the road to Kagbeni where we would stay for a night to get acclimatized to the elevation and to receive our trekking permits for the restricted Upper Mustang. The landscape is incredible. Large rocks emerge from the sand and entire hills look like they were tipped over in a storm. 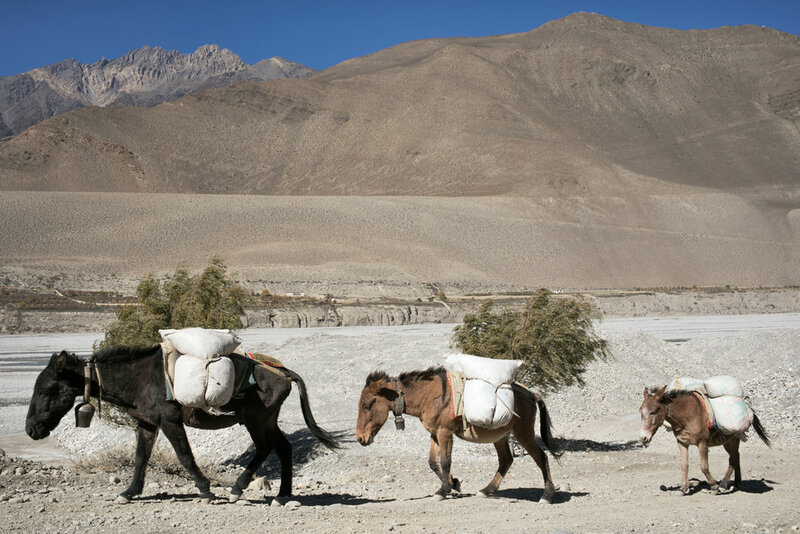 In this region of Nepal horses, mules, and ponies are an essential animal for moving supplies and for traveling. A newly constructed road is accessible to the region, but it is quite rough in many places. Aaron making coffee. During our trek almost all the food was provided by the tea houses and guest houses we stayed in. The one luxury we brought with was a small hand grinder, coffee beans, and an aeropress to make fresh coffee in the mornings. Small villages dotted the road. In the lower regions at the start of our trek the towns were surrounded by a patchwork quilt of different grains, vegetables, and apple trees. The harvest season had passed and we saw a few farmers preparing their land for the winter to come. The Kaligandaki River Gorge with Dhaulagiri and Tukuche in the background. Aaron stands on a ridge with Prayer flags as the morning sun spreads across the distant peak. Dust hangs in the air and swirls as the jeeps, buses and motorcycles pass by. We pulled our scarves over our noses and look down towards the ground to protect our eyes. This road is busy. The road to Muktinath is part of the Annapurna circuit and was one of the busiest sections of the trip. Our guide Lakpa Sherpa and Aaron discuss the geography of the region. The valley walls rise quickly and are a mixture of brown, red, orange, and yellow - a desert palate. We stopped for tea in a small village Kunjok and spoke to a wonderful woman about her weaving. She had scarves, traditional belts, and blankets on display. She was in the process of weaving a yak wool scarf. The town of Jharkot. Here the houses looked old, but well cared for. A woman plows her field. Aaron looks out over the town of Muktinath as we visit the temples. Muktinath has both Buddhist and Hindu temples. The Hindu temple had washing pools and fountains, bells, and incense with powdered dyes. The Buddhist Gompas were small and quite with butter lamps and intricate paintings. A little further along the ridge we passed by large statues. Small rock cairns surround a statue of Buddha. Lakpa and Aaron tie their shoes after visiting a Buddhist temple. A newly built large statue of Padmasambhava. Shadows chase the landscape as the evening sunlight drifts below the ridges. Morning shadows on the Kaligandaki River. 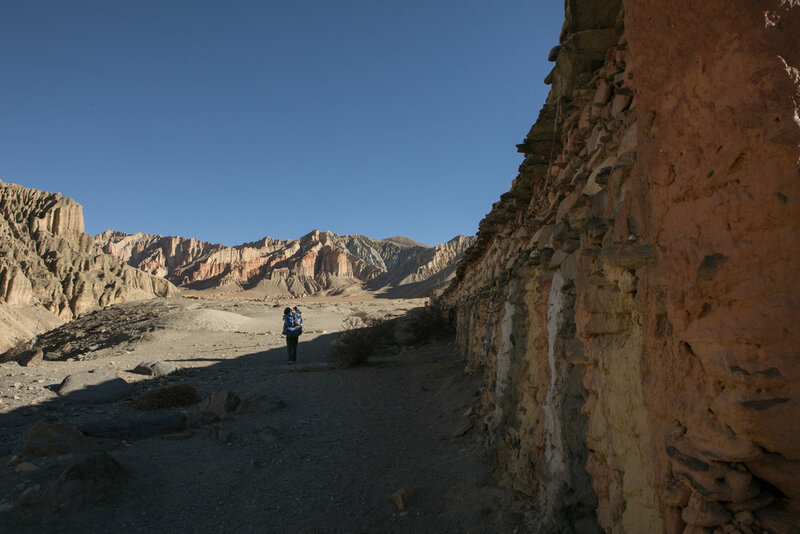 This morning we had received permission to continue our trip into the restricted area of the Upper Mustang. 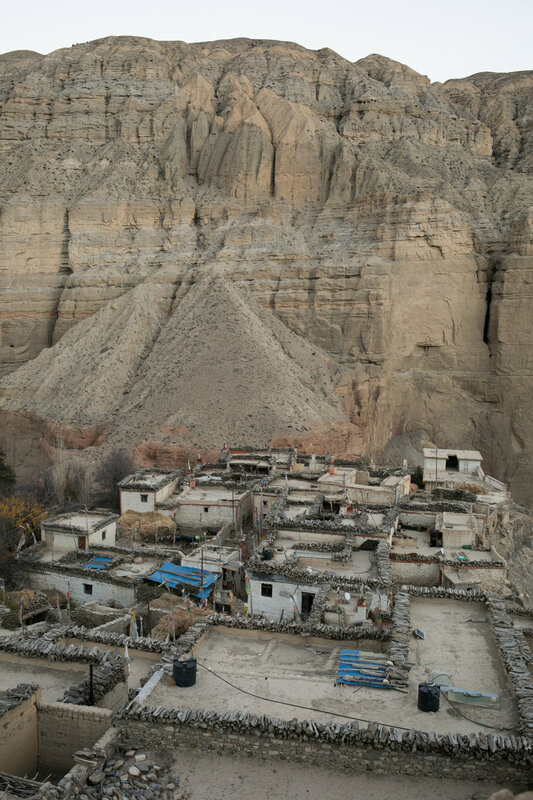 The Upper Mustang opened to tourism in 1992 but only allows several thousand visitors per year. The area was a kingdom until 2008. 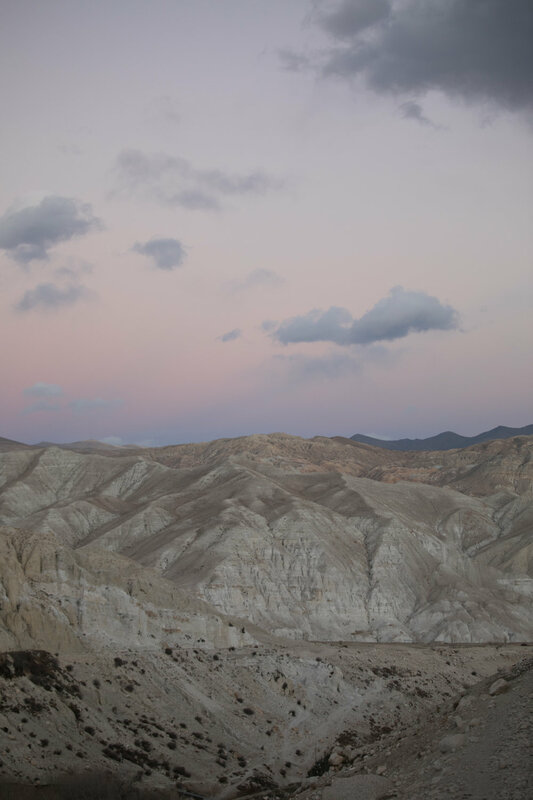 Until recently, not many people traveled to mustang. However, the road is nearly completed and is currently accessible to 4wd vehicles which is increasing the amount of people who can visit. Aaron and Lakpa rest during our walk to Chele. The Kaligandaki River valley began as rolling hills and as we continued walking further up the valley the landscape soon became etched by water and weather. Spires of stone and sand towered precariously along the roadside. Towers of sand and stone stood like small sandcastles you build as a child. The towers seemed to weave in and out of each other and stood collected in groups in the hillside. Patterns of stone and sand. A distant look down the valley. More stone formations. These formations looked like a representation of the undulations of wind in solid form. 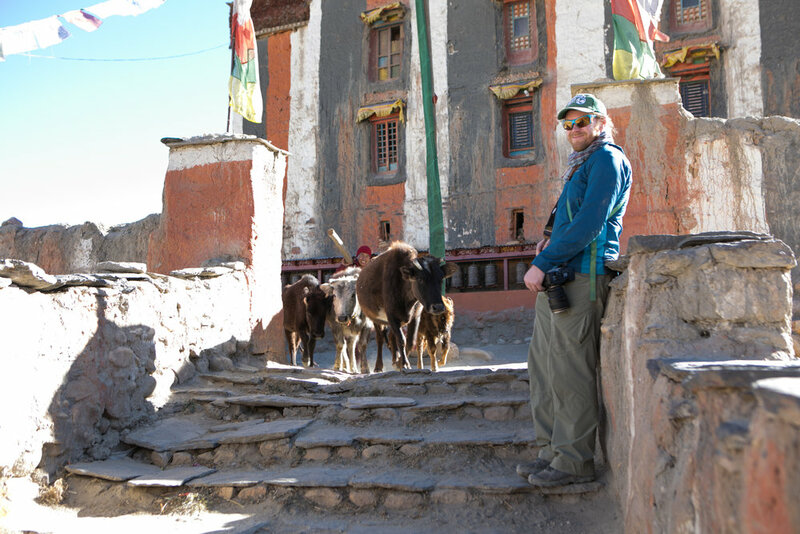 Aaron spotted some of the first stone Chorten that are typical in Mustang. Empty fields after a fall harvest. Aaron peers over the Kali Gandaki Nadi river. Now that we had made it to Chele we would move away from the river and into the mountains. 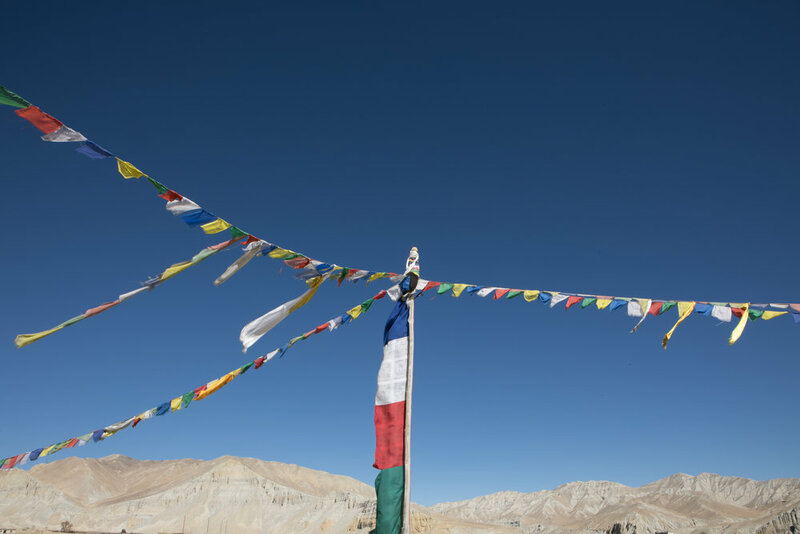 A small prayer flag waves on top of a small chorten. 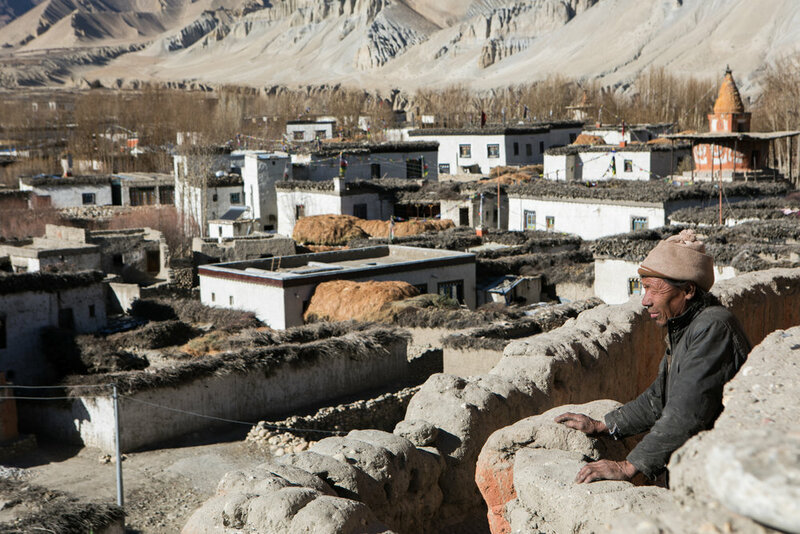 Chele is a small village and is one of the first places to stay in the Upper Mustang. Firewood and kindling is cut and staked around the roof edge to dry. This region has very little access to resources so the community prepares for the winter season early. The view from the roof of our teahouse. Lakpa Sherpa looking out across the valley. We set out on a hike to Ghiling. This day would be our most strenuous hike with climbs up three passes and along some steeper trails away from the road. It was a pleasure moving away from the roads and jeeps, but the hiking was more difficult than what we had done on the road. This is the only photo I had a chance to take while we walked along a steep cliff where the trail was often only wide enough for a few cattle to travel side by side. We could see the Annapurna mountains while hiking high on the ridge. Aaron resting and enjoying the view near Samar where we stopped for tea. Red, White, and Black chortens. We ran into a film crew making a movie about a motorcycle tour along the road in Mustang. The road is rough and bumpy but at times I thought it might be easier by two wheels rather than four. A large chorten at the top of the Shyangmochen La near Syangboche. Prayer flags along the road. After we summited the last pass, we were back hiking along the road. Goats and Sheep. 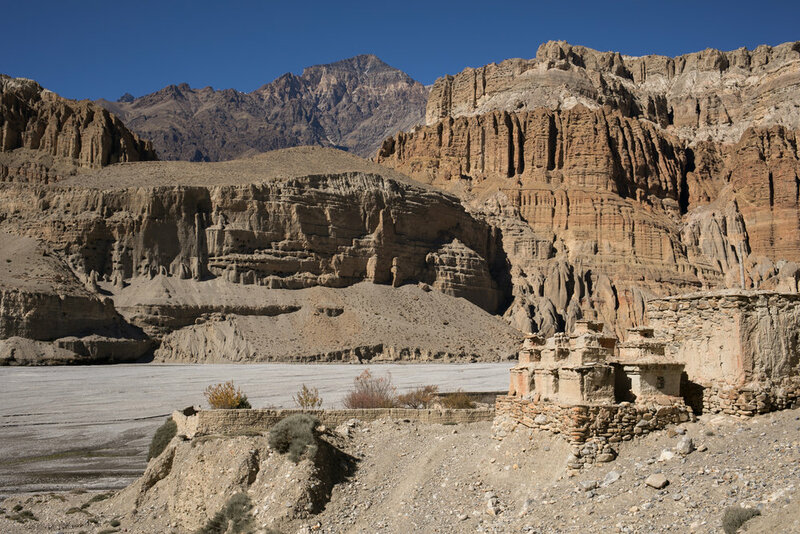 The Upper Mustang was once an ancient trade routes in Nepal. The northern most portion of Nepal shares a border with China ruled Tibet. For many years this region was considered to be a demilitarized zone and tourism was blocked off. There are rumors that the CIA brought apple trees to Mustang to hide surveillance equipment from China among the groves. Now, the region uses farming, tourism, and trade to prosper. We saw hundreds of goats and sheep being raised to trade in Kathmandu. Sore muscles and a tired haze had me moving slowly this day. I was thankful that we had a shorter trek to Ghami. As we were hiking we saw large piles of stone were stacked in cubes along the valley floor in remote regions between villages. We asked our guide about them and he said that people collect the stones and stack the cubes to be used as building materials in the future. Hundreds of stacks were at the ready. An impressive large painted chorten and prayer flags. I was hiking up a pass when a kind monk offered to let me ride his horse to the top. I think he could tell that I was tired and that my fitness was a little lacking in our small group. I declined the nice offer, but he decided to walk with me for a bit to keep me company. He and his travel companion were going north to help care for a monastery for the winter. We had our first glance of the peak Khumjungar and Yakawa Kang. Another flock of goats and sheep lead us into the village of Ghami. Small cattle. During our entire trip I was amazed at the size of the cattle. I grew up on a beef ranch and was used to seeing large, formidable cows. The cows in Mustang stand about waist high and the calves around knee high. I feel like each village I yelled to Aaron claiming that I had found the new Smallest Cow of the trip. Our guide Lakpa is also a Buddhist Lama in his home village. 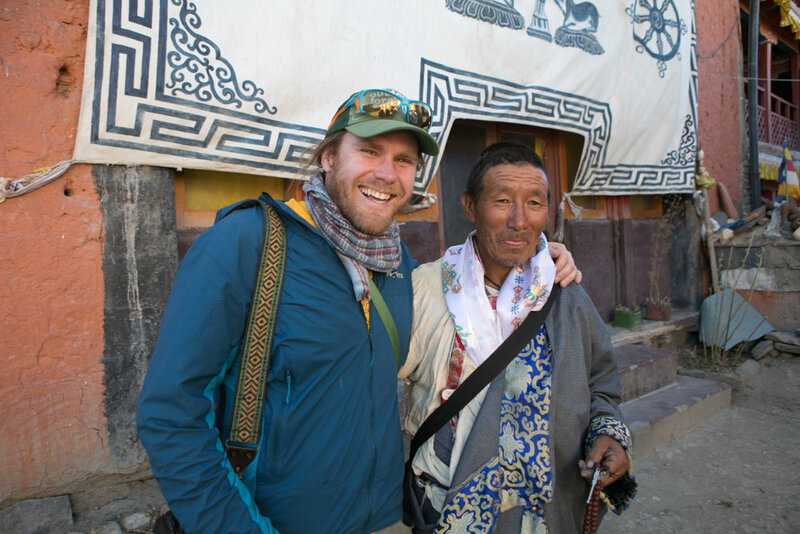 He was eager to share teachings and the history of Buddhism with us and even found a monastery, or Gompa, where we were invited to take a few photos. Each monastery is unique with intricate frescoes of different versions of Buddha, gods, daemons, and the history of the region. The monasteries also have beautifully detailed statues, some ancient, some new. This monastery had showcases of older statues and cloth wrapped Buddhist texts, books, and scrolls. The keeper of this monastary said that 15 monks study in this area. Old buildings made of stone and plaster. Lakpa and Aaron walking past a chorten in town. Lovely old prayer wheels. Prayer wheels are often found in town or near monasteries. As you walk, you can spin the wheel and the prayers written inside will be brought to life as you repeat the phrase "Om Mani Padme Hum." Horses and goats waiting to return to their evening paddock. Each day starts with villages moving their animals from their fenced enclosures in town to open areas to graze for the day. We rarely looked at the time but you could always tell when it was around four o'clock because the animals would begin walking through town back to their homes. 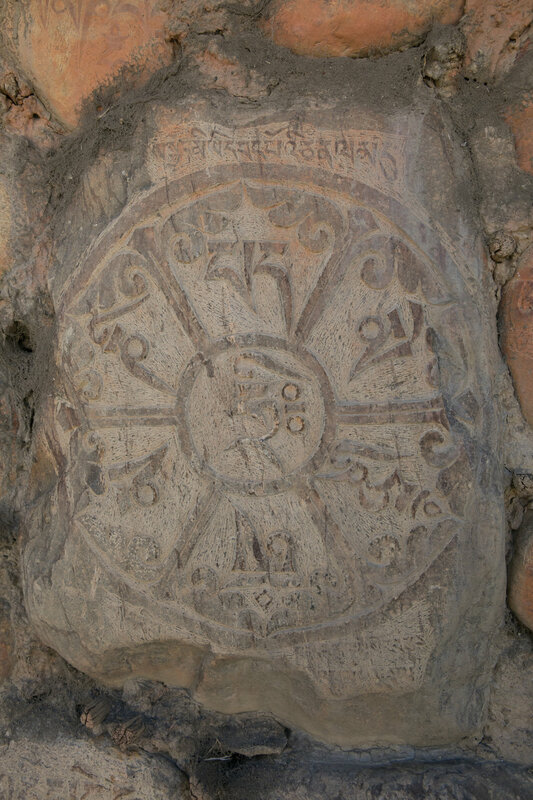 Chorten and mani stones. As we walked through town a tea house owner invited us to see his prayer room and to join him for tea. I don't have any photos but the space was beautiful. As we drank tea his cat trotted into the house and brought us a gift of a dead mouse. We stayed and talked of the road and the controversy around it. Many people don't want the road because they fear it will change this remote region while others want the road to bring in goods and provide access to supplies. He said that he feels his community would remain the same and not lose their traditions with the new trade route. He welcomed the access to resources. We decided to stay. We found a fantastic guest house with Coca Cola, fries, and a beautiful view. We explored the town in the evening and enjoyed our first hot shower in days. We even had time to air out some of our smelly socks. We finished off the day with an apple pie turnover and some local Mustang Apple Brandy. We met in the kitchen for a quick breakfast before heading out. Blue smoke hung in the air and laughter surrounded us. We left Ghami and crossed a small river where we approached the longest Mani wall in Nepal. 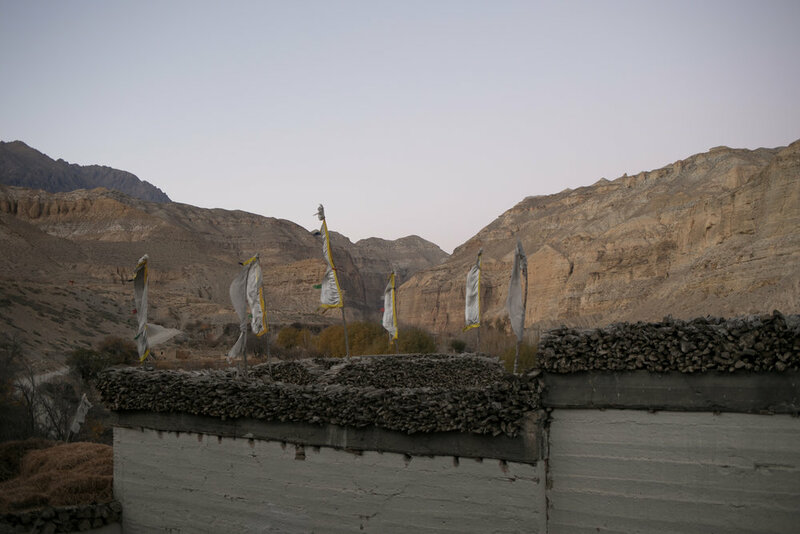 Thousands of stones had been placed to build the wall and hundreds were hand-carved with the Om Mani Padme Hum prayer. You could see small scratches on the rock created by a hand chisel to carve the words. 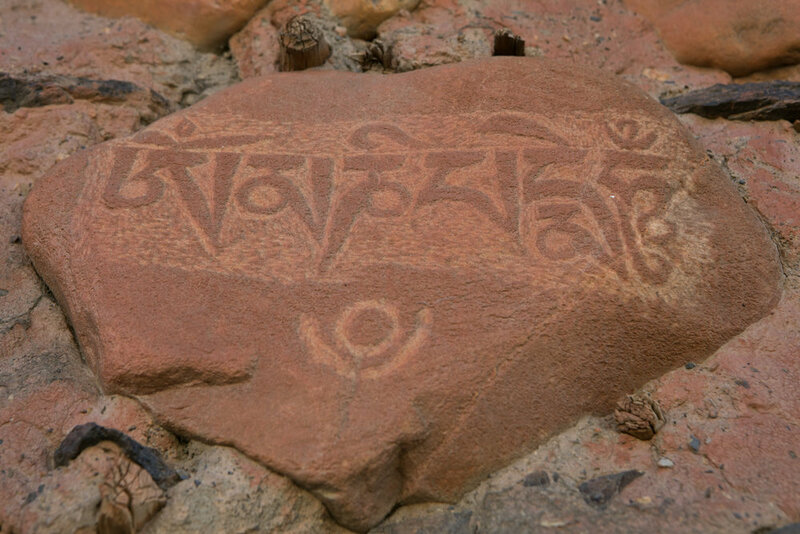 Some stones also had Mandalas and the figures of gods and Buddha carved. Horns of sheep and goats were balanced on top of the wall. We walked slowly and admired the work and artistry that went into creating the wall. Legend has it that a daemon was slain in the valley and that the Mani wall stretches the length of it's intestines. The heart is at an ancient monastery, Gar Gumpa, and the liver in a chorten near Dakmar. We walked the valley where daemons roamed. The space felt special, holy. We walked up and out of the valley with a long climb over the pass. At the top of the pass I threw a stone on the pile for good luck and looked out on to a new horizon of golden hills. Aaron photographing the hills of Mustang. Stacked stones at the top of the pass. An easy slow desent would lead us to the village of Charang. A large chorten stands at the gate of Charang. Aaron and a Mani Stone. A painting on the chorten gate of Charang. After lunch we walked through the town to visit the Monastery. The town was incredibly quite and later we learned almost completely abandoned for the winter. A few people stayed to take care of the region during the cold months, but many people left to stay with relatives in the south. Prayer wheels at the Charang Monastary. When we arrived it was closed so we walked around the outside enjoying the arcitecutre and quite space. Monastary yards. Later, we found out that the monastery was built by the Guru Padma Sambhawa before reaching tibet in the 8th Century. Our guide employed the help of a villager to see if we could contact the Monk who was the caretaker of the monastery. He let us call but no answer was to be had. As we walked around the outside of the monastery we saw a monk chasing cattle from the courtyard. He took us to the Kings Old Palace and helped us view the monastery later that day when the people of the village came to give thanks. The King's Old Palace. Samdup Gedphel Gyalkhang. The palace was mostly empty, much of it falling apart. We entered a room to see a single butter lamp burning in front of a series of old statues. We were able to visit the Puja room to see ceremonial instruments including carved masks for chasing deamons, two dried bear paws, a dried human hand, thangkas, and bells. View from the Old Palace. Chortents and the Old King's Palace. We were able to view inside of the Monastery which was incredibly impressive. The walls were covered with paining of different versions of Buddha. One large wall was covered in showcases, each with an ornate statue of gold and bronze. I was in awe of the statues. The last wall contained books and scrolls of the old palace, the greatest ancient library in the kingdom of Lo. Hundreds of books lay stacked along the wall, each with a beautifully carved cover, wrapped in colorful embroidered cloth. Lakpa opened one book and with the permission of the monk who was caretaker, let Aaron and I touch the cover to our heads. Lakpa read from two of the pages which were written in gold ink which got smaller and smaller as the pages were turned. It would take 4-5 days for one monk to read the book out loud. The books have been aged at 700 years. The monastery was rich in history, culture, and faith. As we finished our tour, the entire town showed up for an evening visit. It was a holy day so many people presented gifts of Katas (blessed silk scarves) to the statue of the high Lama. The women gathered together after their visit and I asked permission to take their picture. They pulled Lakpa into the photo. A village man who met us in a prayer room where he detailed the gods to pray to for many children. He was very kind. Aaron and I felt very luck for the experience and access to such a wonderful palce. Prayer wheels and small statues made of ashes. Small figures handing above a door. We joined our tea house owners in the kitchen for dinner. We shared a bottle of Kukurhi Rum and the host family offered us more refills of Chang than we could handle. Chang is a homemade grain beer of sorts that is thick and cloudy white. It is an honor to be offered chang by a family, but you need to be weary, once you accept the drink, it may not stop coming. I had to flip my cup upside down to tap out of the festivities. In the cold air our bodies began to warm from the inside. Our guide Lakpa refers to Chang as an Extra Blanket for good reason. On your way to Gar Ghompa you pass through 108 red chortens, many with prayer flags and Mani stones. Rows and rows line the valley entrance. Chortens outside of Gar Ghompa. Aaron and Lakpa reading the history of Lo-Ghyekar Gompa (Ghar Gompa or Gar Ghompa). It is debated to be one of the oldest monasteries in the wold, built in the 8th century. The monastery was covered in carved tiles of stone rather than the typical paintings. The statue room had a small, naturally occurring carving, and statues of important Lamas. The monk who was acting as the care taker invited us to sit with him for tea and cookies before we left to go back to Charang. An ancient prayer wheel that is split. You can see the rounds of cloth that fill the inside of a prayer wheel with prayers written across the fabric. Prayer flags flutter in the wind. Each strand that releases from the flag is considered a prayer being let out to the world. Today we left for the Kingdom of Lo, the walled city. The hike was gradual, but our bodies were tired. The day was full of wind, dust, and by accident thorns from a prickle bush that I sat on. 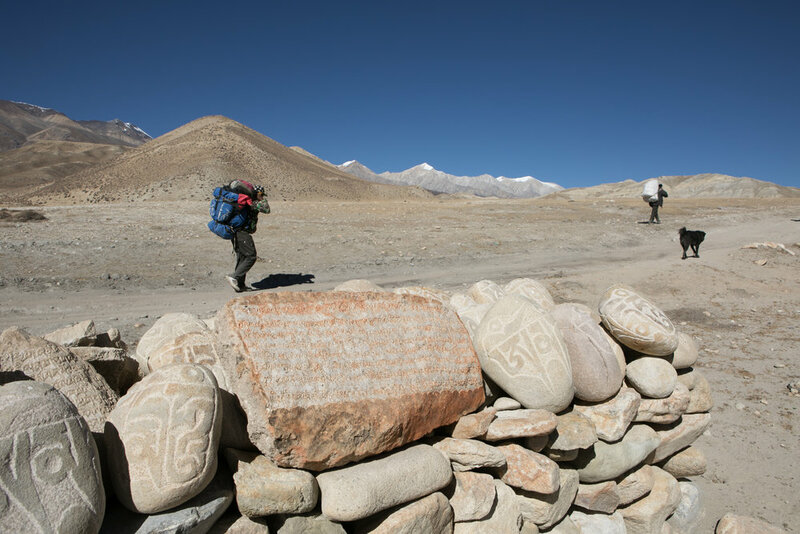 Our porter, Ram, walking near a Mani wall on the way to Lo Manthang. A black dog joined us on our entire hike, sticking close to Lo Manthang. The walled city can be seen below in the distance. Aaron and Lakpa waiting for the monks to organize a tour of the monasteries in Lo Manthang. We stayed an extra day to tour the artist area where painters studied 10 years to paint Mandalas and Thankas. We toured a museum, the Thupchen Gompa with impressive large statues of four protectors of the directions, inside were equally massive statues. Large wall paintings accompanied the statues and a vaulted ceiling added to the enormity of the space. We were able to view several restoration projects in progress to repair some of the ancient paintings. We next visited the Jampa Monastery where a single 50' Buddha statue sits in a room surrounded by 108 mandalas. Parts of the walls had fallen down and were marked for restoration. Mandalas are my favorite. I could have sat there all day. Unfortunately, I was hit by a quite severe stomach bug and was in bed for the rest of the day. Aaron went on a day hike the buildings atop the hills across from Lo Manthang while I finished a book and started a second. Mustang = happiness. We fell in love with the pace of life trekking. We were disconnected from the internet, our phones, and had time to focus on reading, eating good food with kind people, and spending our days outdoors. A goat herder on the way to Chosar Valley. Yellow, white and black Chortens. A beautifully painted chorten outside of the Chosar Valley. Prayer flags and peaks. During our walk to the ancient caves, we crossed several rivers and watched as the landscape opened up. It was also the first time we had seen clouds in the sky for nearly a week. 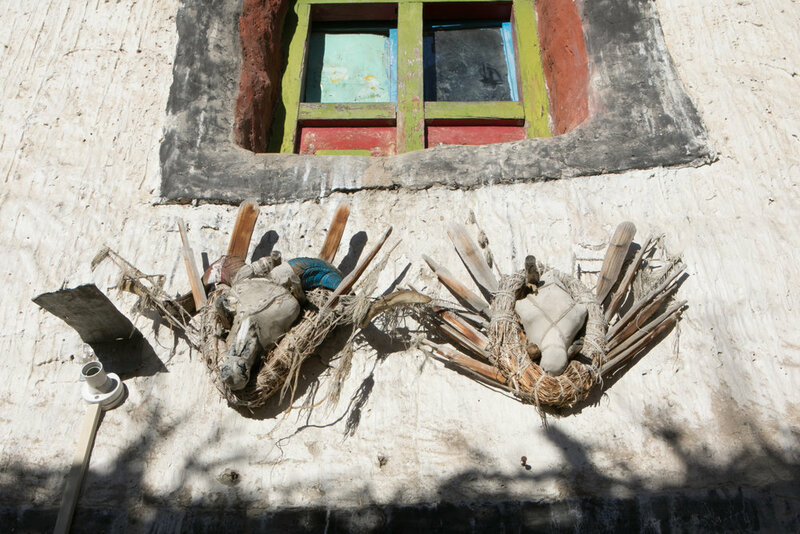 Small windows, doors, and homes were carved into the valley walls in ancient times. These caves were believed to be carved in the time when the Bon religion was dominant before Buddhism entered into the area. The view of the valley through a cave window. Our local guide enjoys an intimate moment in the soft light through a window carved into the cave wall. A beam of light coming from a window in the upper level highlights dust in the air. The cave system is a series of rooms joined by hallways and multiple levels now accessed by ladders. I was surprised by the number of rooms in this dwelling. You can still see marks on the rocks where the caves were carved many years ago. Lakpa Sherpa descending to a new room. 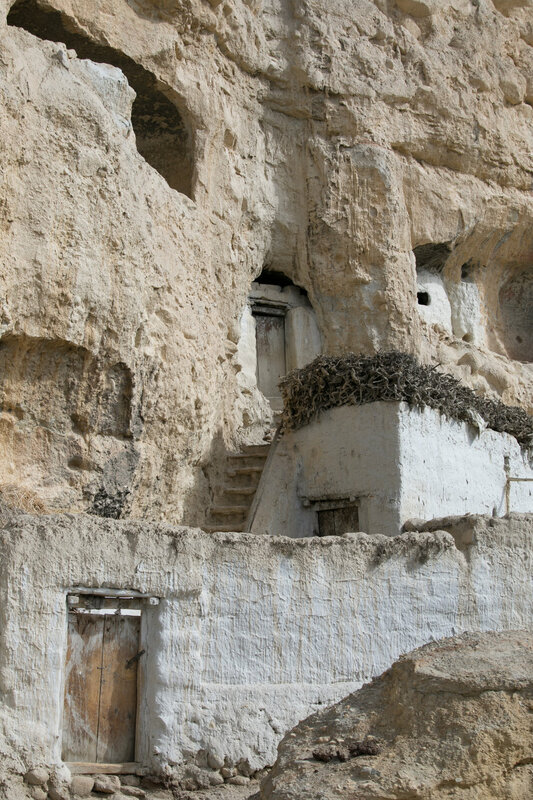 Known as the Cave Monastery, this modern monastery is built around an ancient cave used for meditation. The monastery is being cared for by a young monk over the winter and is a place of study in the summer. The small town in Chosar. Little calves were waiting on the doorstep of the second monastery in town. This monastery also held statues and paintings, but was different in that the walls were black with light paint depicting a scene that looks like the start of a war. The characters had fierce faces and our guide explained that this painting depcited a battle with daemons. 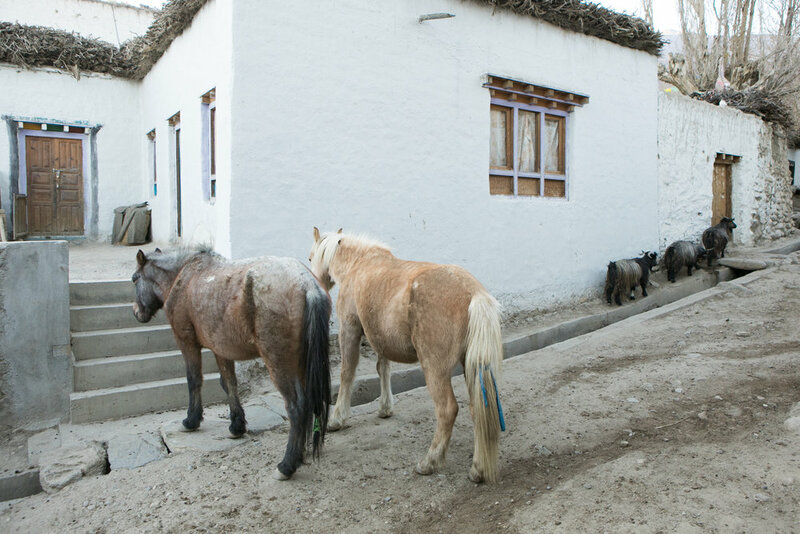 Many people still rely on small mountain ponies as a mode of transportation along the newly created roads. For many years before the roads were created people were limited to horseback and foot travel to navigate the region. A tourist and guide ride through the Chosar valley. A home built around a cave dwelling. Pastel purple, pinks, and blues blend together as the last light of sunset falls below the horizon. 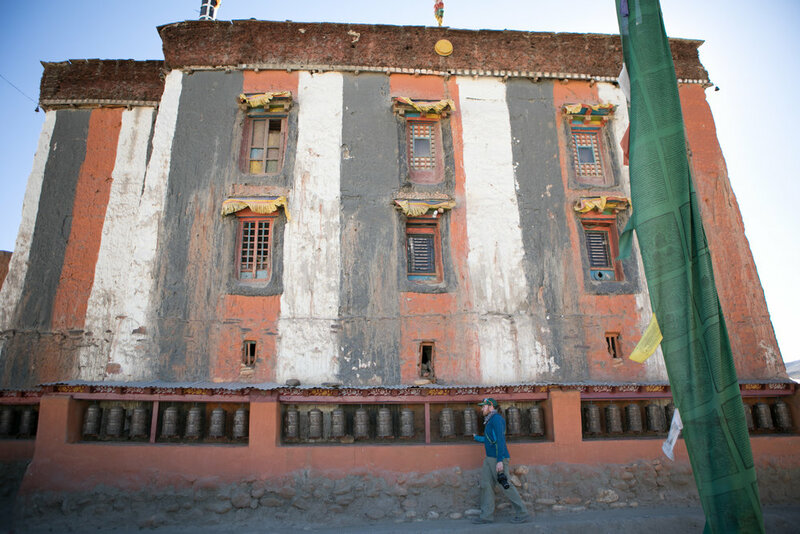 Each evening the community of Lo Manthang walk the perimeter of the city to the Monestary for prayer and reflection. We completed our trip along the road in Lo Manthang. In the future, a trade route will be open in this area. Change is inevitable and many people in the region are hopeful for easier access to goods and resources while remaining hopeful to maintain their traditions and culture. Goats returning to Lo Manthang in the evening. Motorcycles and tourists walk through the streets of Lo Manthang. This evening we celebrated American Thanksgiving with an Apple Pie, Kukuri Rum, and Rakshi provided by our host. Our guide Lakpa joined us in the celbration. One jeep, two jeeps. This morning we packed our bags and prepared ourselves for a day of driving. The plan, to take a private jeep down with two other travelers. The reality, we squeezed into the community jeep with a total of 10 adults and one child. After some negotiating, Lakpa was able to trade the old man on his lap for a very small child. The road was bumpy, rutted, windy, narrow, covered in ice, areas of rockfall. Our driver kept us moving along the road. I've never seen anything like it. A tractor clearing away rock fall. Note the cliff edge a few feet to the side of the tractor. I joked that if the baby next to us could keep his calm during the trip there was no excuse for me. 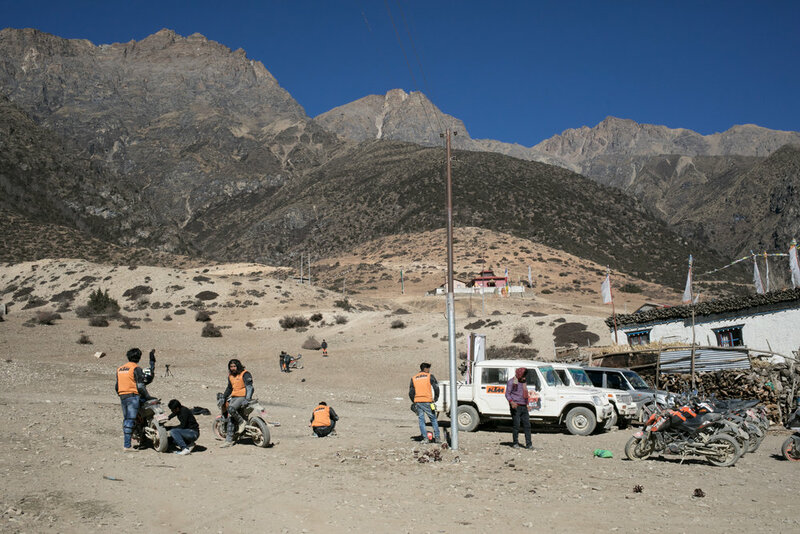 We got to Kagbeni, had our passes stamped and paid a little extra to ride down to Jomsom. Tired in Jomsom. The transition back to town was difficult. We had the rare opportunity to disconnect from our jobs, our day to day hustle, and get back to the basics in life. We were stunned by the number of people in the streets and the number of vehicles we passed. Our trip to Mustang was at an end and we were already missing our time there. A few happy cell phone snaps from the trip. Prayer flags and a mountain pass. Aaron fixing his film camera. During our Trek Aaron didn't have a chance to have a Khata blessed by a Lama so Lakpa arranged an opportunity for us to meet his teacher for a blessing. It was truly an honor to visit this man in his home, to share tea, and to recieve a blessing.